Government clouds are not all the same so we’re starting a dialogue on our strategy for building the Microsoft Government Cloud, exploring several areas we believe are highly valuable differentiators. Details matter when government, defense and intelligence agencies decide which cloud platform will deliver their mission critical services to citizens and constituents. Today I’m going to talk about how we support compliance with Criminal Justice Information Services, or CJIS. It’s part of our industry leading compliance portfolio and represents our commitment to doing the hard work to make compliance simpler for our customers. 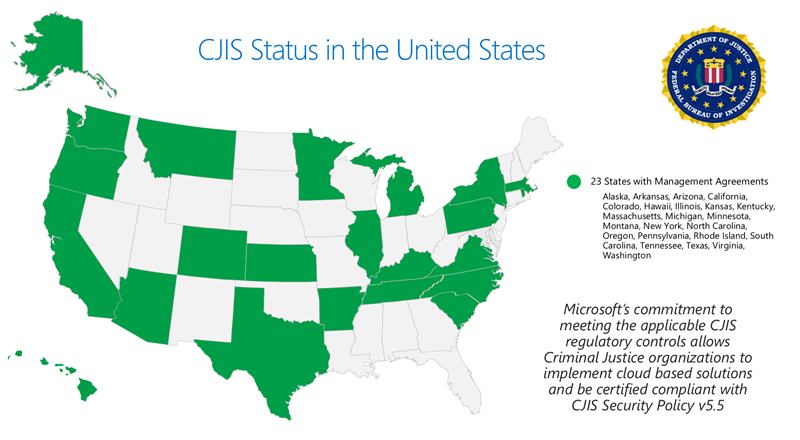 CJIS is the most critical compliance requirement for state and local governments adopting the cloud as it ensures police and public safety personnel use information technology securely and with the right privacy controls. State approval of applicable Microsoft employees thru fingerprint and background screening. Yes – we are really giving the fingerprints of our operational staff to each state! CJIS Security Awareness Training completed by each employee with potential access to data with 30 days of assignment. This exceeds by five months the CJIS Security Policy requirement of six months. Signed addendum by Microsoft as a corporation and each applicable employee. Every employee is individually committing to meet CJIS standards as a condition of their employment. State review and acceptance of Microsoft attestation to CJIS controls thru review of security reports and physical data center inspection. No other provider provides the transparency and insight that Microsoft provides with regards to CJIS. In December 2012 Microsoft was the first hyperscale cloud provider to contractually attest to the applicable CJIS controls with a signed CJIS management agreement and CJIS Security Addendum. It was three years before any other major cloud provider. Since 2012, we have worked one-by-one to sign agreements with 23 states and our goal of reaching all 50 remains very much in sight. Police body worn video cameras are one of the biggest emerging technology disruptions today in justice and public safety and its applicability under CJIS continues to evolve in every state. We’re prepared to support each state’s decision with our comprehensive CJIS strategy. Read more about Miami-Dade’s story on our Transform Blog. Miami-Dade and VIEVU are not alone – hundreds of states and partners such as The State of California and partners like Taser have made the same choice. We are committed to building a Government Cloud you can trust and that means meeting or exceeding the standards required to transform mission critical government and defense workloads to the cloud. Public safety services provided by US state and local governments is one of these workloads and we are proud to offer the deepest and most comprehensive compliance to CJIS in the market today. I invite you to sign up for a Free Azure Government Trial, to experience the security and trust of the Microsoft Government Cloud.